Apple CEO Tim Cook is counted among the more than 350 executives of major U.S. corporations who on Thursday signed a letter imploring President Donald Trump keep legal protections in place for undocumented immigrants brought into America as children. Cook joined Google CEO Sundar Pichai, Hewlett-Packard CEO Meg Whitman, Amazon CEO Jeff Bezos, Microsoft CEO Satya Nadella and many more top executives from businesses throughout Silicon Valley and beyond in signing a joint letter penned by immigration reform group FWD.us. The organization is backed by Facebook founder Mark Zuckerburg. Addressed to Trump, U.S. House Speaker Paul Ryan, House Minority Leader Nancy Pelosi, Senate Majority Leader Mitch McConnell and Senate Minority Leader Charles E. Schumer, the letter seeks a continuation of the Deferred Action for Childhood Arrivals (DACA) program, which ensures children illegally brought into America are safeguarded against deportation. As noted by Recode, Trump is expected to announce a dramatic shift in immigration policy on Friday that would substantially erode DACA protections. The president could make good on campaign promises and do away with work permits for undocumented young adults, leaving them open to deportation proceedings under U.S. law. Further, the nearly 800,000 people already covered by DACA might not be able to renew work authorizations once their current documents expire, the report said. "Unless we act now to preserve the DACA program, all 780,000 hardworking young people will lose their ability to work legally in this country, and every one of them will be at immediate risk of deportation," the letter reads. FWD.us estimates an immigration policy reversal would strip some $460.3 billion from the national GDP and $24.6 billion in Social Security and Medicare tax contributions. "Dreamers are vital to the future of our companies and our economy. With them, we grow and create jobs," the letter says. "They are part of why we will continue to have a global competitive advantage." While technically incorrect, the term "Dreamers" has become synonymous with children, young adults and working adults who benefit from DACA. A separate proposal, the Development, Relief, and Education for Alien Minors (DREAM) Act, was proffered in 2001 as a potential path to residency for certain individuals living illegally in the U.S., but the legislation never passed. The letter concludes, "We call on President Trump to preserve the DACA program. We call on Congress to pass the bipartisan DREAM Act or legislation that provides these young people raised in our country the permanent solution they deserve." Immigration reform is of particular interest to Silicon Valley tech companies, which boast a healthy ratio of foreign employees. Aside from potential legal snags related to existing employees and their families, strict immigration rules might hinder recruiting efforts. 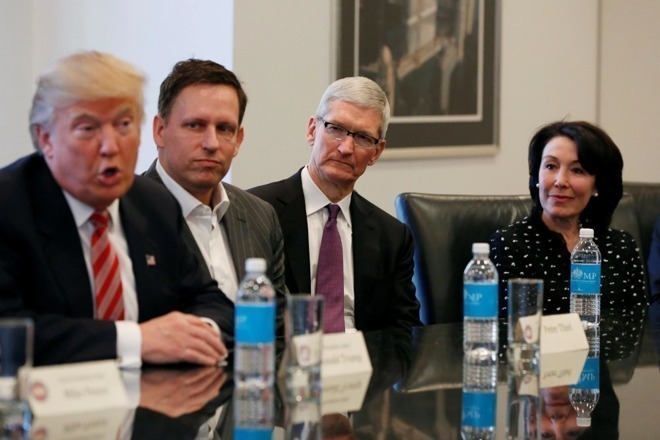 Along with efforts led by powerful tech consortiums, Apple has been a particularly outspoken critic of certain Trump administration immigration policies. In January, for example, Cook decried Trump's contentious order to temporarily block citizens of Muslim-majority countries Iran, Iraq, Libya, Somalia, Sudan, Syria and Yemen from entering the U.S. in a letter to employees, saying hundreds of Apple workers were impacted by the action. Cook and other tech executives met with at the White House to discuss a clampdown on the popular H-1B visa program. At that same meeting, Cook reportedly urged Trump keep DACA in place. More recently, a technology interest group representing Apple and a number of other big industry names earlier this month rebuked a bill designed to slash legal immigration levels in half within a decade.